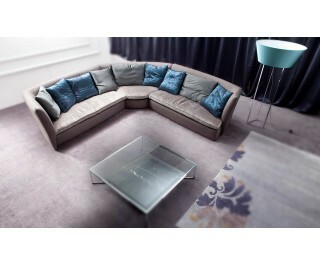 Elegant and refined sofa with high back and seats very comfortable and enveloping. Available in fabric or leather. Steel frame covered with polyurethane foam without CFC. Base in solid wood and multilayer wood, springing system with elastic webbing padded with non-deformable polyurethane foam. Seat cushion in goose feather with polyurethane foam insert without CFC Back cushions in natural goose feather.